Shigong Han is a 10th Dan Level of the Chee Kim Thong (aka; Xu Jin Dong) branch of Nan Shaolin Wuzuquan (South Shaolin 5 Ancestors Fist). He is the only senior master in Europe and is authorised by the International Wuzuquan Union in China. Shigong Han was born in Singapore in 1940 just before the Japanese occupation. In his youth he enjoyed all forms of sport, but his greatest love was always Traditional Chinese Wushu. He has learnt various systems of Chinese Wushu but solely in order to understand the principles of each system. However, the only system he has found which truly complements Wuzuquan is Wujiquan. He is indebted to Grandmaster Ye Qing Hai (aka; Yap Ching Hai), whose knowledge of Wuzuquan and advice have helped him to develop his understanding of the art, but most of all for introducing him to Shizu Xu Jin Dong (aka Chee Kim Thong). His education in martial arts began at the age of twelve when his late father taught him a Southern Chinese martial arts system and when he was thirteen he took up Judo for three years. One day, when he was in his early teens, he witnessed a fight in school that changed his whole outlook on Traditional Chinese martial arts. It was a friend of his who had no martial arts training that easily defeated his opponent who had been training for fifteen years, by simply kicking him in the groin and down he went. Shigong Han decided then that he needed to practise free sparring in order to develop his reactions. So he took up Taekwondo to gain experience in, and to improve, his free sparring. He studied this Korean art for eight years, teaching it for the last five of those years. However, he eventually reached a stage where Taekwondo was unable to offer him anything more, so he studied the Wu family Taijiquan. In 1972, he took his family back to visit his in-laws in Petaling Jaya, Malaysia. During the course of a conversation with his late father in-law, he mentioned that he was interested in learning a good, Traditional, Chinese martial arts system. Without any hesitation he arranged for him to meet his next-door neighbour, Mr. Ye Qing Hai. He met Mr. Ye (his Shixiong, or “elder brother”) and a few days later he introduced him to his master, Shizu Xu Jin Dong. From that day, he never looked back as he had found what he had been searching for. Early in 1973, he took a month’s annual leave to travel to Malaysia and train all day, six days per week with Shizu Xu. He taught and explained the heart of the Wuzuquan system to him. In 1974: he started the first overseas Wuzuquan School in the United Kingdom and was appointed Chief Instructor. Over the next three decades, Shizu Xu continued to teach him Wuzuquan and in addition taught him Wuqi, Wuxing Palm, Luohan Ru Yi Quan, the 18 Luohans, a Northern System, and the 108 Drunken Monkey system, consisting of eight characters, of which he completed four. Shizu Xu kindly agreed that he would come to the UK one year and Shigong Han would go to Malaysia the following year to train with him. Whenever he visited Malaysia to train with Shizu Xu, he would arrive at his home before 7:00 am each day and go to market with him so that he could buy fresh ingredients for breakfast. He always cooked breakfast for Shigong Han and the other students before training for the day. In 1976, Shizu Xu came to visit Shigong Han in the UK for the second time. He sat in a lotus position and invited one of the guests, a Taekwondo instructor, to chop the top of his head as hard as he could. Unfortunately, the guest suffered a severe headache that lasted four hours and he had to be driven home. Shizu Xu suffered no ill effect at all. In those early days in Malaysia, most training was conducted on weekends in Shizu’s home and twice on weekdays at Mr. Ye’s home. On weekends the training usually started at 7:00am and finished about 3:00pm. Shizu Xu prepared breakfast and lunch. 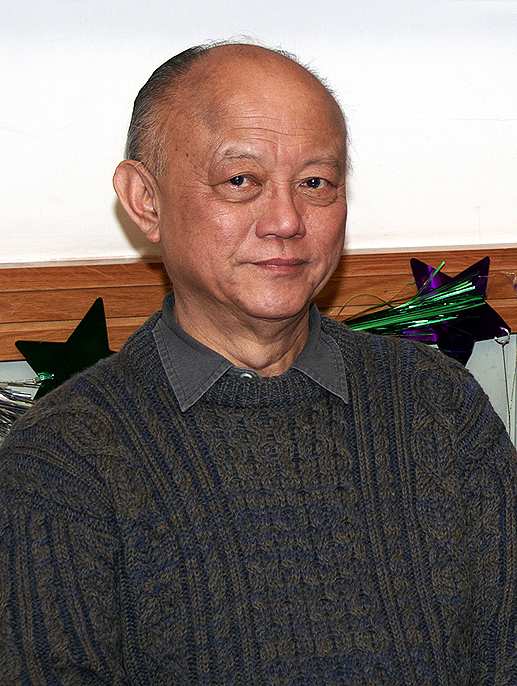 Shigong Han felt privileged to be taught and trained by him. Shizu Xu would make them train and repeat Sanzhan over and over again until we understood the meaning of internal power and softness. The training at Mr. Ye’s home was very enlightening, especially when Shizu Xu would arrive – usually about 9:00pm, after the class had finished. He explained and demonstrated the Wuzu principles in great detail to them. Shigong Han will never forget the night when he demonstrated how he transferred his Jin to the Sword against the Cudgel. Mr. Ye Qing Tian attacked Shizu Xu with the Cudgel and Shizu Xu blocked with the Sword and sent a shockwave like an electric shock to Mr. Ye’s arm. At first Mr. Ye Qing Tian wasn’t convinced and thought that it was just a coincidence. He attacked Shizu Xu again and the same thing happened again. He was totally convinced by Shizu Xu’s unique ability to extend Jin to the Sword. When they asked how he had done it, Shizu Xu just gave them a wry smile. In 1978, Shizu Xu visited Shigong Han in the UK for the fourth time. This time Shizu Xu took his shoe off and asked one of the classes senior students to stamp on his toes as hard as he could. The student did just that and felt nothing there at all. In 1980, the UK school participated in the 4th South East Asia Sanshou Championship and one of Shigong Han’s students, Phillip Ennis, won a gold medal in the middleweight category. Two years later in the 5th South East Asia Sanshou Championship held in Hong Kong, Linden Stephens won a silver medal for heavyweight category. In 1985, Shigong Han was appointed the National Wushu Coach for Great Britain and remained in that post until 1993 when he decided to retire. During this period, Great Britain had a very successful Wushu team and consistently won multiple gold, silver and bronze medals at every European Wushu Championship. In 1988, at the 3rd International Wushu Championship held in Hangzhou, one of the team members, Wu Shu Kin, won a Gold medal for Spear (men) and a female member, Laychan Thoong, won 3 Bronze medals. We also won a Gold medal in the exhibition event. In 1988, Mark Sexton, a native of Dublin, Ireland with plenty of time to kill, was wandering across the wilderness of North Ealing, London when he stumbled across a Wuzu class in progress. Soon he was training regularly. Through him, Shigong Han was introduced to his colleagues in Ireland, who, it turned out, were seeking a teacher. After several meetings and seminars, he invited them to become his students and in 1991 they formally began teaching Wuzuquan on his behalf in Dublin, Ireland. In the year 2000, we celebrated Shizu Xu’s Eightieth birthday. He gave a demonstration of Qi by heating up a dozen bottles of mineral water and gave it to his disciples to drink. In the year 2000, Shigong Han was approached by Nigel and Andy of KIXX Martial Arts to become their then new full time KIXX Martial Arts Gym. They had trained and travelled the World with Shigong Han for many years learning number of the martial arts. They knew first hand of Shigong Han’s skill, knowledge and status in the martial communities in America, Europe and the Far East. Shizu Xu Jin Dong did a tremendous amount of charitable work for his home village in Putian that, due to his modesty, not many people knew about. He collected donations from his many disciples to build new roads, accommodation for teachers, the restoration of a Taoist temple and other works. On the 12th of April 2001, Shigong Han’s master passed away at the age of 82 years leaving no successor. As his most senior disciple in Europe, it is his duty to try to preserve and propagate Wuzuquan in Shizu Xu Jin Dongs name. The above is a modified extract, taken with Shigong Han’s permission, from his first book of Wuzuquan called: Fundamentals of Nan Shaolin Wuzuquan.